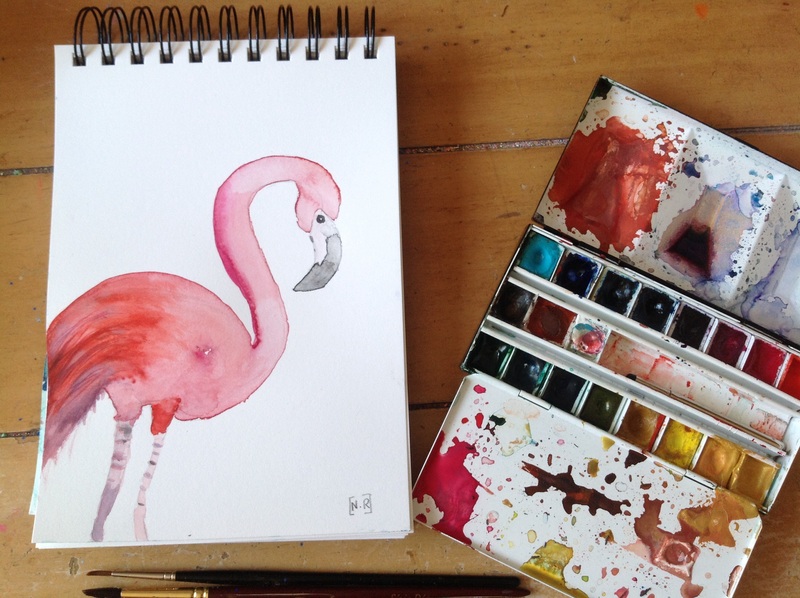 I woke up this morning with the urge to paint a flamingo. 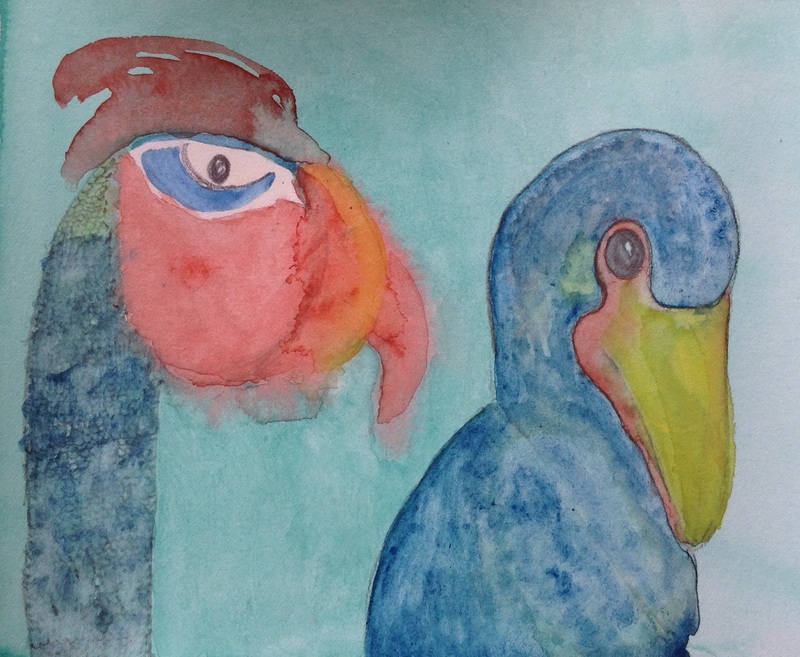 I thought about it for a while, and I started playing with my watercolours. Bird number 1 came about (the one on the left, probably not an early bird by the looks of him). I thought I’d try again, and bird number 2 turned up, right next to number 1. 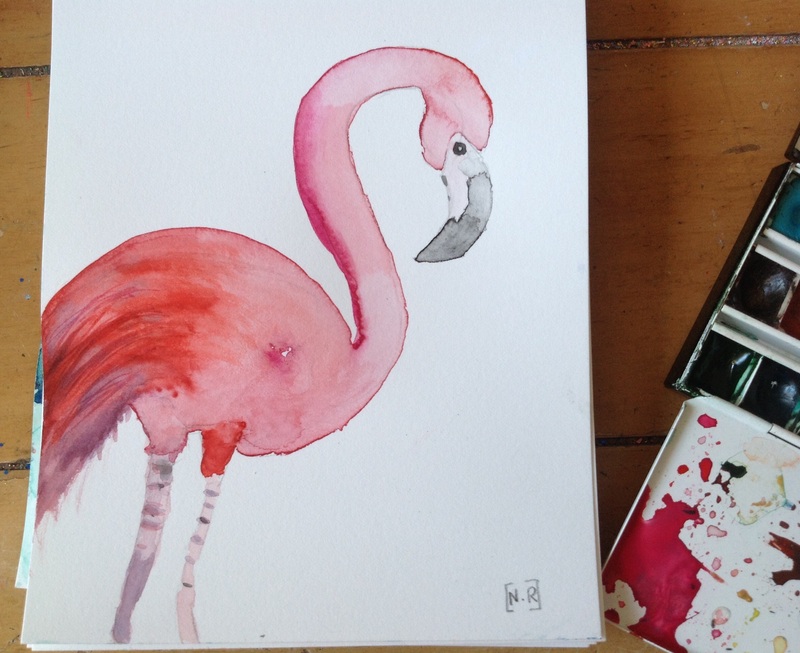 I closed my eyes and tried to think about flamingos… About the fact that I thought for years that the name of the band Pink Floyd meant Pink Flamingos – Which I suspect is the case for a lot of French people. When and where did I see one? In this country I only saw a few in captivity, once. In my childhood I saw them both in semi-captivity and in the wild, in Camargue, France. Camargue is a stunning natural region in the south of France. It’s one of Europe’s most important wetland sites and is the home to more than 400 species of birds, including pink flamingos and The Greater Flamingo. I think it’s one of the very few places where one can watch flamingos in the wild in Europe. My parents took me there for the summer holidays once, when I was a kid. I got to see many different species of animals. The ones I remember the most are the flamingos (the pink flamingos and The Greater Flamingos), the wild camarguais horses, very ferocious mosquitoes and the most picturesque sunsets I ever got to see. The Greater Flamingos are the tallest of the 6 species of flamingos. Anyway: to Camargue and to the Flamingos! trés beau ce flamand ….